Glasses were clinking, wines were being poured, great conversations were happening, the weather was perfect and Flavor Camp was about to begin. Wine Yakima Valley treated those of us who attended the WBC Pre Conference tour to 2 incredible days exploring the Yakima Valley. (You can catch our overview here). This first evening was spent at Owen Roe Winery. We managed an impromptu winery tour with Co-Owner David O’Reilly and now we were on to Flavor Camp. 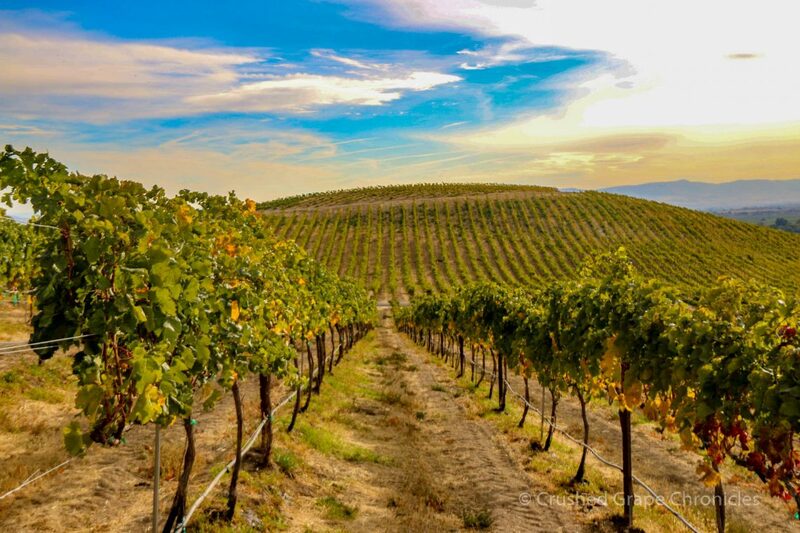 The Yakima Valley is an agricultural region and in addition to grapes for wine, they also produce apples for cider and hops for beer. We were treated to an in-depth look at these with Flavor Camp. You will get to hear about the Cider and Hops also, but we are about wine here, so…. We are at the Owen Roe Union Gap Vineyard in the Yakima Valley. 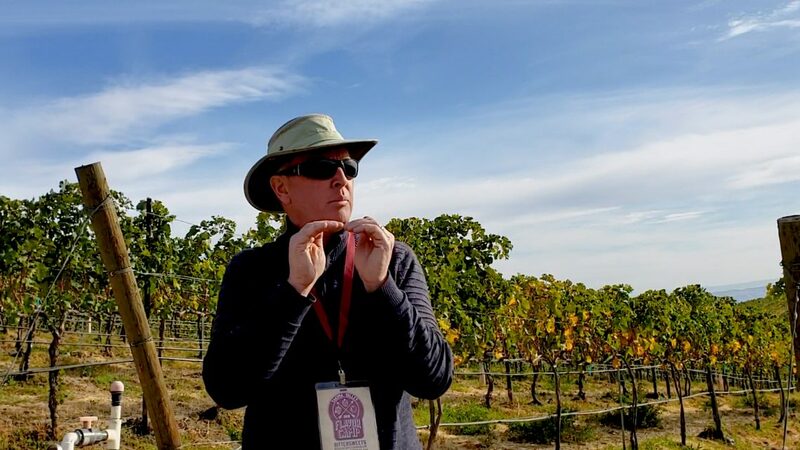 As we climb into the back of the all-terrain vehicle with about a dozen wine writers, David explained that we are about as far West in the Yakima Valley as you can go. “From east to west there is not a big temperature difference.” David tells us, but Walla Walla, where we would be going the following day, was at 30 degrees the night before, where as Yakima was at 40. The cold air rushes down the valley. 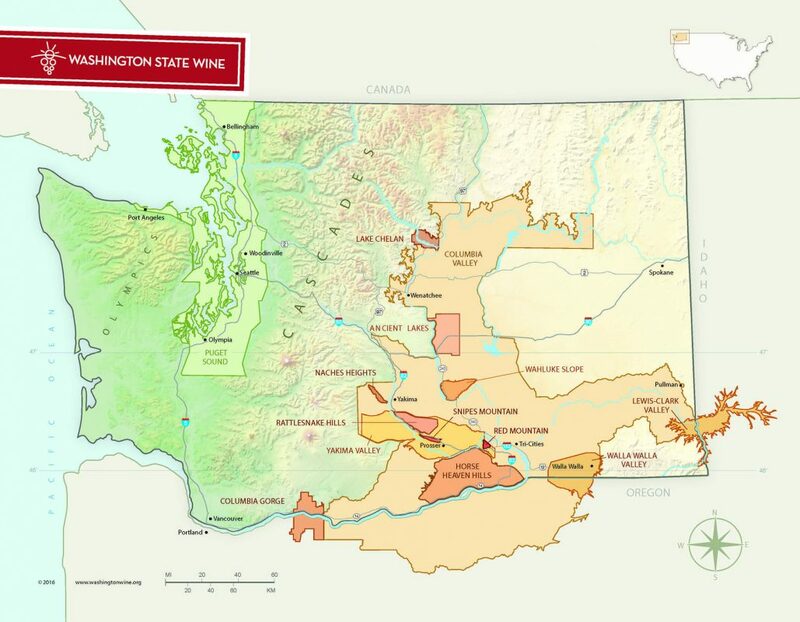 For a bit of perspective, take a look at this Wine map of Washington State, Courtesy of Washingtonwine.org you can see Yakima about at center east/west in the state, with the cascades to the west, compared to Walla Walla to the east. 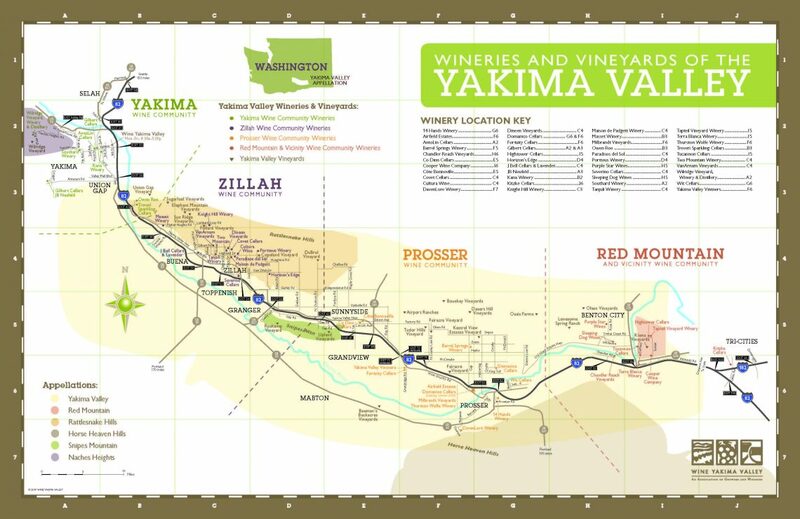 Here on this map of the Yakima Valley courtesy of WineYakimaValley.org you can see the Union Gap Vineyard all the way west. This tour would take us through 3 of the distinct soil types on the vineyard and we would taste the flavor profile from each. 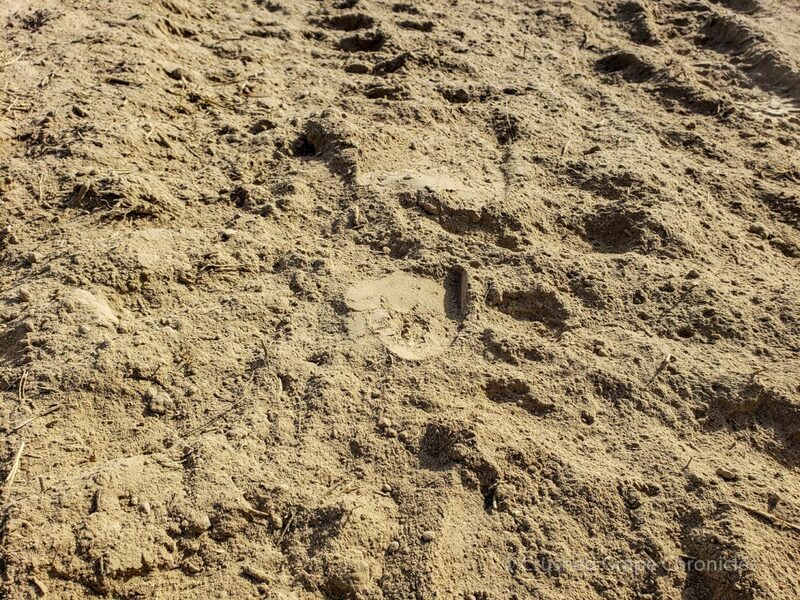 We drove up the hill and stepped out at the top, into soft loose dusty soil that immediately covered my shoes. As people walked, little puffs of dust erupted in their footsteps. “Loose soil” is your clue here. This is loess. Loess soil at Owen Roe’s Union Gap Vineyard. David pulls out his altimeter app to check the altitude (we all scrambled to find this app). We were standing at 1199 feet. Now it’s time to talk a little soil history. If you read our piece on Montinore, you may have some of this history! If not, you can find it here, where Rudy Marchesi explains the Missoula Floods. This property sits at the convergence of Glacial Lake Missoula. We would pass the Wallula Gap tomorrow as we headed to Walla Walla. This is where the Ice dam backed up the water, eventually lifting and flooding the valley, creating the Columbia River Gorge and impacting the land and soil all the way into Oregon. The water here in Yakima came up to about 1150 feet, so the soil we were standing on was above the glacial flood. The soil here are silts (really fine). David pointed out the hillside where you could see the sub soils of basalt and ancient rock that are about 22 million years old. Soils here on top are shallow making it good for Bordeaux varieties. At the top of the hill where we are standing, they grow their Cabernet Sauvignon. This is clone 47, David tells us, a clone with small berries, this wine retains it’s fruit and has beautiful acid. We are tasting the 2014 bordeaux Blend with is a Cabernet Sauvignon, Cabernet Franc, Merlot & Malbec blend, with Cabernet Sauvignon from this vineyard block. In the summers, up here, the sun is up at 6 am and the soils tend to stay warm overnight. They have less of a diurnal (day to night temperature) shift then Red Mountain. Photosynthesis is maximized when the soil is warm so the grapes here ripen earlier and the wine is less tannic and more textural. We strolled down the hill, creating little dust storms and ending at the block of Cabernet Franc. David explained the planting method. The soils that are most shallow are planted to the latest ripening grape varieties (cabernet sauvignon), the deeper soils toward the bottom of the hill are planted to merlot, which has big clusters that ripen early. Here in the middle is where the cab franc grows, ripening later than merlot and before the cabernet sauvignon. Cabernet Franc is a favorite of mine and of David’s it seemed. He spoke of this ancient grape, father to cabernet sauvignon and how it likes cooler temperatures. In hotter years it gets finicky. This end of the Yakima Valley is about 4 degrees cooler than other sites in the valley during the day, but it stays warmer at night. This gives the cabernet franc “gorgeous texture and keeps that perfume in the grape”. We taste the 2015 Cabernet Franc. This year was warmer and the cabernet franc was finicky. They had to pluck out the green berries by hand from the bunches. The first major heat will shut photosynthesis down. The 2014 by comparison was very Bordeaux in style and was chunky and tannic. 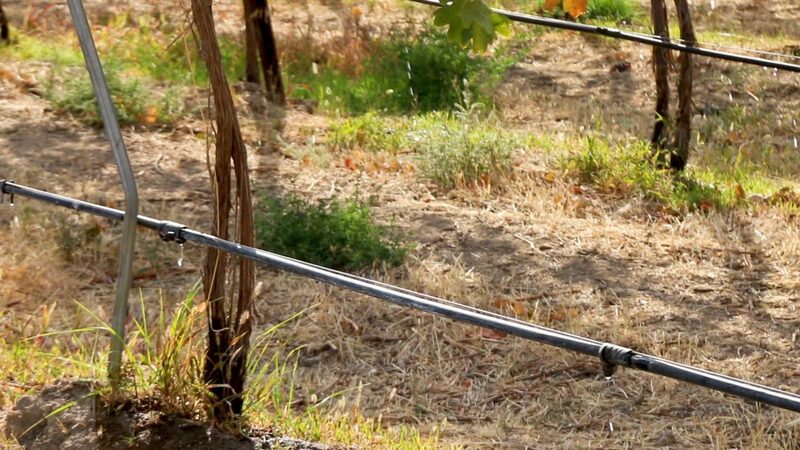 In so many wine regions we are trained to think of irrigation as bad and dry farming is good. That would be to stress the vines and keep those roots digging deep. Here, with the lack of rain fall, it is necessary. The region gets only 7 to 8 inches of precipitation each year, and the definition of a true desert is anything less than 10. The cherries in the valley, David tells us, use 10 times the amount of water as the vines here. Further down the hill we get into the glacial soils where you find calcium carbonate, the white substance we had seen above. These glacial silts have a little deeper soil and give you rock and minerality, the wines are finer than if they were grown in loess & deeper soils, that present as more aromatic and textural.The Oldest soil type here is the Ellensburg Formation, which is old Columbia Riverbed. This predates the Yakima River & the basalt activity. These are actually “anti-clines” that formed through earth movement. The upthrust that we were standing on at this point was at almost 1200 feet. This is not glacial. Anything lower than this was not upthrust, it was just washed away. Ellensburg is found in high elevations. 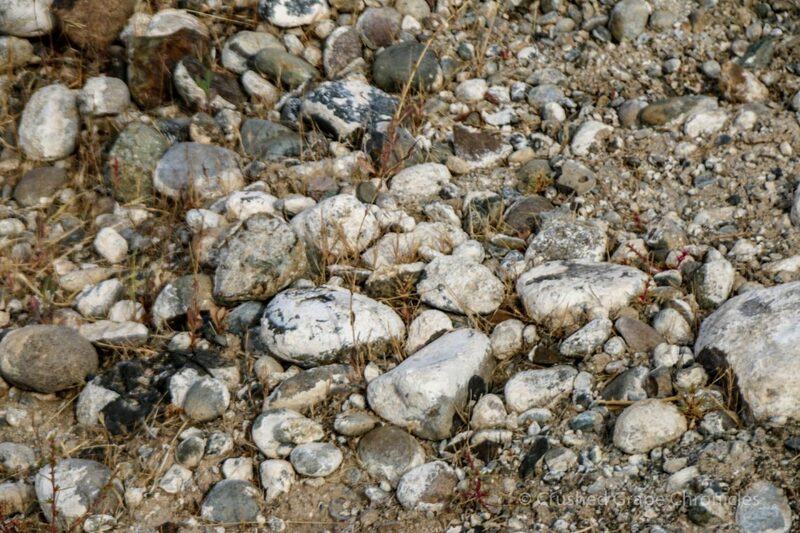 In Walla Walla the famous Rocks AVA is all on riverbeds at the Valley Floor. What makes this great for Grenache is that Grenache is cold sensitive, so you want it high in the vineyard so the cold air rushes down. Sounds counter intuitive, it’s at one of the highest elevations & yet it ripens early. Okay…all this talk about soils and wine, are you thirsty now? 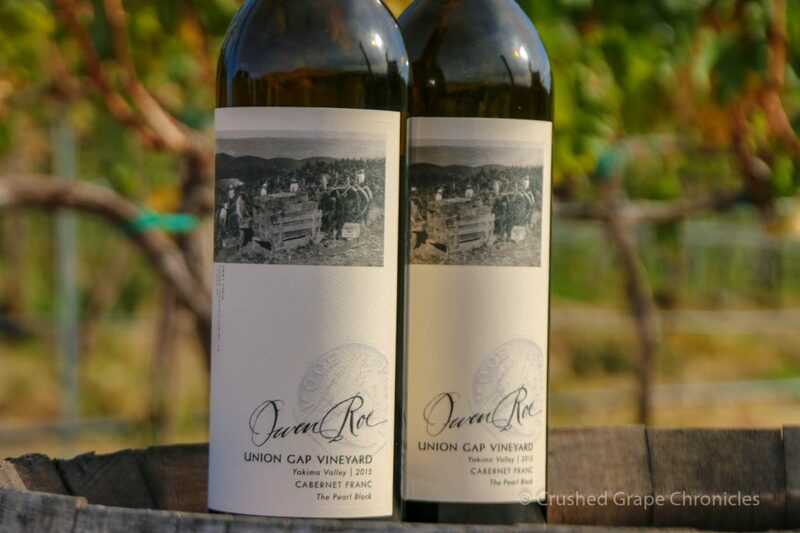 Search out a bottle of Washington wine, Owen Roe if you can find it, and enjoy our video tour with David O’Reilly. Watch for more on Yakima Valley Wine, coming out soon! ← Full fermentation bins! A walk inside Owen Roe Winery at Harvest. We sure wish we could have been at ‘Flavor Camp’ with you. 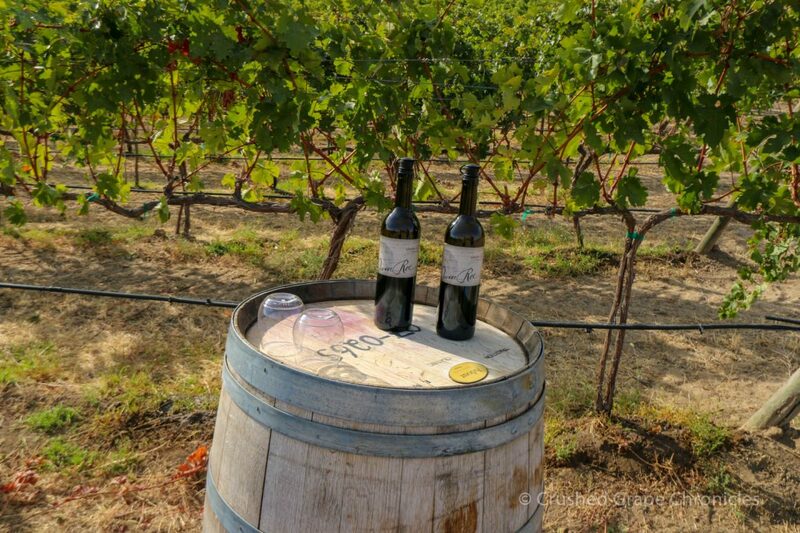 Washington is easily one of our favourite regions and the variety and quality of wine is truly first class. Wine Yakima Valley did a Spectacular job with this pre excursion tour. We really wish you had been with us too! I am a big fan of Owen Roe wines. I really enjoyed learning about the soil here and the history of the floodplane. Very informative article!